is supported by espruino ? if yes, which library ? This lists the commands - there might be a similar display in the modules currently supported - or you could try to write a specific module for this board. Ahem no, i'm too much noob to be able to make a library! I managed to get the 2-colored one working on Espruino as part of my IRL Chrome T-Rex game project. You can find my initial PoC code in this gist, or check out the final version here. 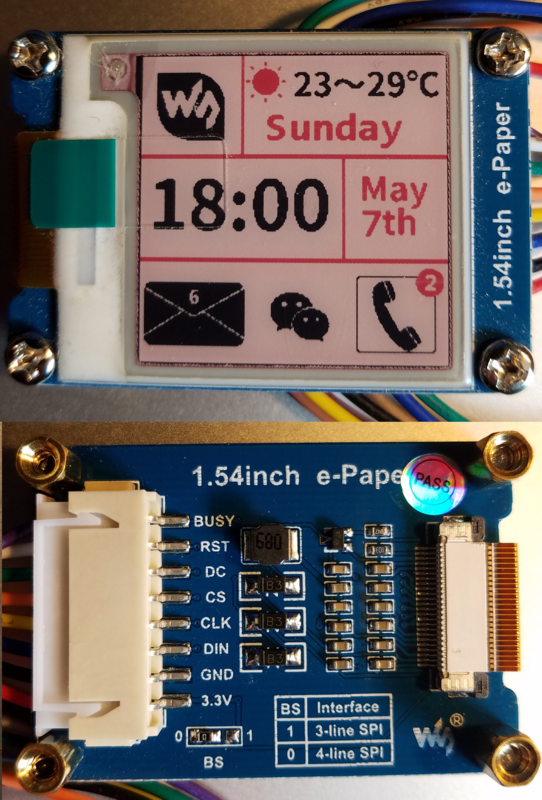 So this is a working library for waveshare e-ink? Do you have an example usage code for this? It's not a library per-se, just a code example. You can run PoC the code in the gist and it should draw a t-rex image on the screen (assuming that you have a similar model to mine, otherwise adjustments might be needed). Then you can look inside the display.js module of my game and use it as a basis for a library. You will probably have to manually change the pins in the code to whatever pins your display is connected to. Good luck! Dear allObjects, did you find the time to use this display with espruino ? I have the one as shown in attached pictures. I still hope to find time at one point to connect it. More recent activities included connecting the Espruino Graphics object to displays built with NeoPixels. Some functions needed speed up - saving/restoring/moving and copying around of areas - for which I used inline C..., which btw works really nicely, as you can see documented in this conversation about Efficiently moving things around in zig-zag Graphics buffer visualized w/ 24/32 bpp displays / neopixel strings.